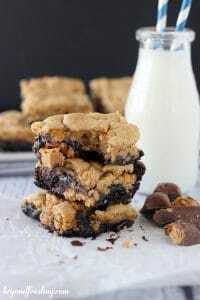 Gooey Mississippi Mud Brookies - Chocolate Chocolate and More! 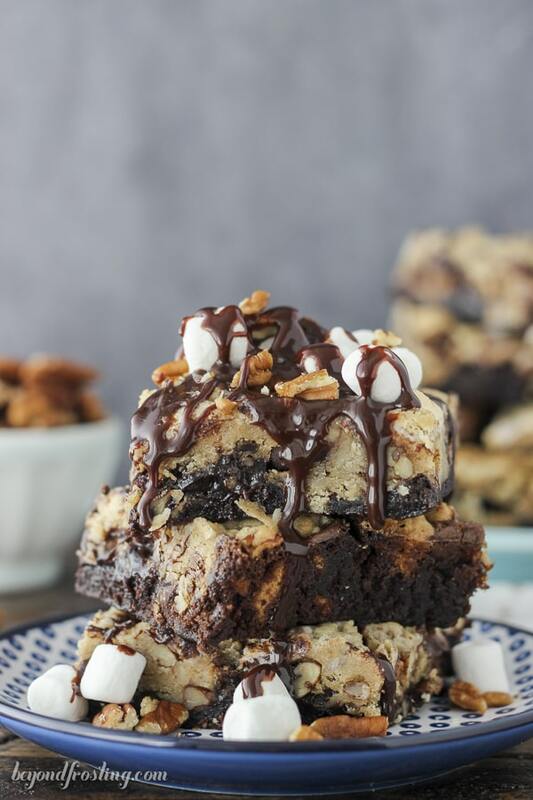 These Gooey Mississippi Mud Pie Brookies are layers of fudge chocolate brownie and chocolate chip cookies mixed with pecans and mini marshmallows. Oh my, I can’t believe how long it’s been since I made Brookies. There was a time when I was slightly obsessed with this brownie/cookie combination and I just couldn’t stop. Well guys, I think it is safe to say that my obsession has resurfaced. Over the weekend I was trying to decide what to share with you this month. I tried to think of what Joan’s readers really loved. Joan once told me how popular her Mississippi Mudslide Cake was. I thought about making a mud pie cookie, but I wanted them to be extra chocolatety. I had one of those light bulk moments and brookies came to mind. Mississippi Mudslide turned into Mississippi Mud PIE. That’s a lot of miss-iss-ippi for one sentence. Surely you have heard of a brookie before, right? 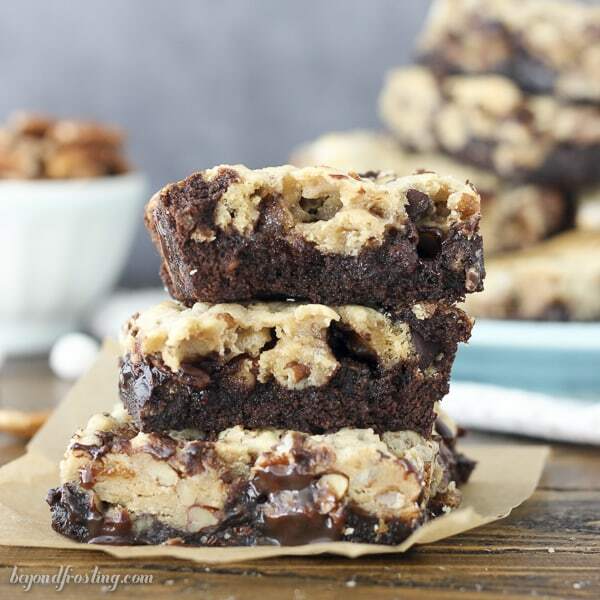 It’s basically a brownie baked together with a cookie. When I make brookies, I always have the double layer. 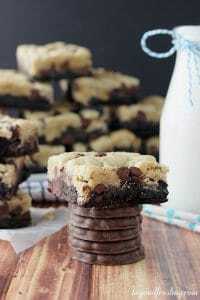 You get the fudgy chocolate brownie on the bottom and the soft chocolate chip cookie on top. For these brownies, I’ve gone ahead and added crushed pecan and mini marshmallow. The pecans are nice and crunchy because I’ve not only added them into the cookie dough, but I’ve also sprinkled a layer of them on top of the brownies. I’ve done the same thing with the mini marshmallows. 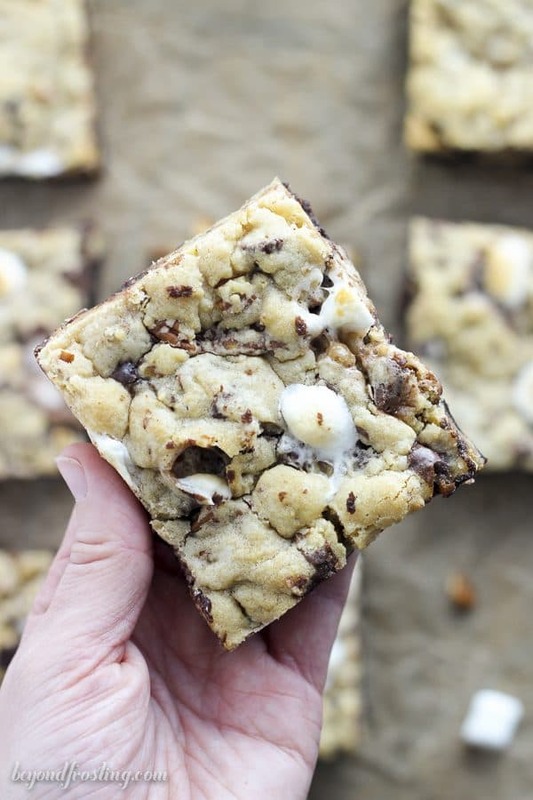 This way, you’ve got that ooey gooey marshmallow pieces in every piece. It’s the same thing I did with my Marshmallow Oreo Brookies. I thought about sharing these with my coworkers on Monday, but then I decided to throw them in my freezer for a rainy day. Just don’t tell me coworkers, mmkay? For this recipe, you will need a box of brownie mix. You will mix the batter according the instruction on the box. 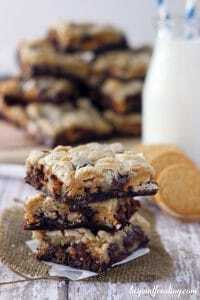 Now I’ve never made them with homemade brownie mix, but I certainly think that is a good idea! Spread the brownie batter over the bottom the pan. Then you make a batch of cookie dough, mix in all the magical goodness (Pecan and Marshmallow, I’m looking at you!) and gently layers it on top of the brownies. I like to flatten the dough with my hands, and then put it together like a puzzle on top. It all bakes together and looks uber pretty. Hooray! Now time to go grab one of these from the freezer. Might I suggest warming these up in the microwave and drizzling with hot fudge? How about a scoop of vanilla ice cream? Now we’re talking. In a medium sized bowl, combine brownie mix, egg, vegetable oil and water according to the instructions on the box. Beat until thoroughly mixed. Line a 9x13” pan with parchment paper or a baking mat. Pour the brownie batter over the baking mat and spread evenly. Sprinkle the top of the batter with ½ cup crushed pecans and ¾ cup of mini marshmallows and gently press into the brownie batter. Soften the butter in the microwave for 10-15 seconds. Combine the butter with both light brown sugar and granulated sugar. Mix until smooth and the mixture becomes fluffy. Add the egg and vanilla extract and beat until the egg is thoroughly incorporated. In a separate bowl, combine the flour, salt and baking soda. Slowly add the flour mixture to dough batter while mixing at a low speed. Once all the flour has been added, increase speed to medium until dough forms. 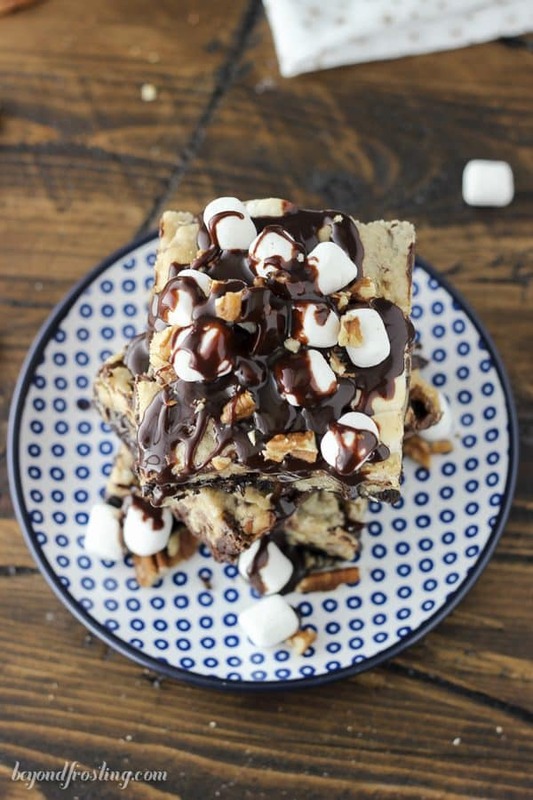 Add chocolate chips, remaining pecans and marshmallows last and fold into cookie dough. 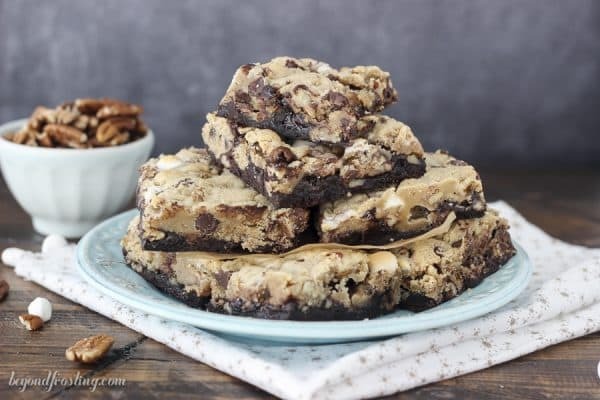 Take the cookie dough and drop chunks onto the top of the brownie mixture, gently pressing them down into brownie batter. Do you best to cover evenly. Bake for 25-28 minutes at 350°F. Remove from oven and allow to cool completely before cutting. Since I used a baking mat, I was able to completely remove the sheet of brookies from the pan before cutting. If the brownie is still too gooey, I suggest refrigerating before cutting. Do you love these brookies? Make sure you stop by for more! Thanks Christina. Let us know how yours come out.